After such an underwhelming performance in Gibraltar, I have to admit the prospect of dropping points against a Georgia team that had dominated us possession wise both games in the last two campaigns was worrying me. We’d ridden our luck in the 1-0 win at home and the one all draw in the away leg was one of the worst performances I’ve witnessed on an away trip. A three-hour delay while on the runway before flying home on Monday evening had taken the shine off a great Sunday night with Dutch and Spanish branches of our support in Malaga. After saying goodbye to all that afternoon as people began making their journeys home, we’d taken a walking tour around the city and had some dinner and a couple of straighteners to take the edge off the previous few days’ excess. The plan to arrive home around 10.30 and get an early night went out the window with a computer fault just before take off and having had to taxi back to the gate for running repairs, the delay meant that it was 1.30 in the morning when we got in having spent six and a half hours on the plane. Needless to say, this didn’t help the dose of the fear the next morning although at least I didn’t have to suffer getting up for work at five hours after getting to bed, unlike Mrs False First XI! 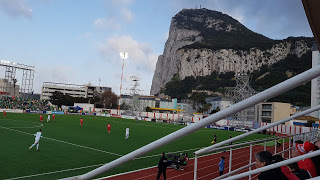 Even so, I was still pretty weary when I surfaced a couple of hours later and attempted to get the Gibraltar blog written before heading over to Lansdowne Road that evening. As it happened, events overtook me and the finalising of the blog had to wait another day. 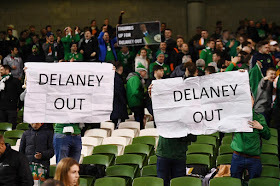 While touring Malaga the previous day, talk of protests had started to filter through on various WhatsApp groups after the further revelations around John Delaney and his recent employment change. The one that seemed to be gaining traction was the suggestion that tennis balls be thrown onto the pitch during the game but no one seemed to be aware of where it had originated. The only post mentioning it on YBIG was from someone with no posting history and there didn’t seem to be much on social media about it either. Despite this, the media were determined to run with it but being in the middle of a tour meant I had to pass the chance to talk to Joe and discuss it on Liveline after a request came in. However, when a request came in to do a piece on possible protests with Sky Sports the following day, I felt that as a committee member of the YBIG Independent Supporters Mandate, we should take the opportunity to talk about why supporters were feeling the need to protest. With them looking to get someone before 4pm, it meant leaving a couple of hours before my plan so before I got to finish my Gibraltar piece it was into a cab for a slightly different pre-match routine. Part of our brief within the Mandate is to raise issues that concern supporters and, following what we saw as heavy-handed responses to protests before, we had put the item on the agenda when meeting with the FAI and had minuted what are appropriate means of peaceful protest and what is allowed without intervention from stewards, police or authorities present. So, after issuing a statement the previous day highlighting that again, I found myself standing in front of a camera in front of the West Stand, more than a little nerve-wracked, trying to put those points across to Sky Sports’ Guy Havord! I’ve done a couple of pieces to camera over the years but it’s generally been post-match when I’ve had a few drinks beforehand and when emotions are high which gives a bit of Dutch courage. This was a lot different but at least I had the security of seeing Guy Havord trip over his lines on the first take. Luckily enough for me seeing as he’d managed to mispronounce my name before that despite his practice beforehand! Anyway, second time around went alright despite the nerves and after saying goodbye, I went off for food with a little adrenaline still moving through the veins. A bowl of hot chicken wings in The Gasworks settled that but having watched the 5pm bulletin with no sign of my interview, I assumed they’d gone with whatever other footage they had and thought no more about it. After making my way up to The Beggars for the traditional pre-match preparation, I was just settling into a second pint when my phone started hopping to various piss taking texts from lads who’d spotted my mug and before long the videos started arriving to more mickey taking at the pub itself. Looking back, it shows how much I know when I said I didn’t see the tennis ball protest happening! Slagging aside, there was a good atmosphere and a bigger crowd around than the last couple of times we played Georgia. There were a few groans around when the team news came through with the recall of Glenn Whelan and the absence of Matt Doherty the main complaints. 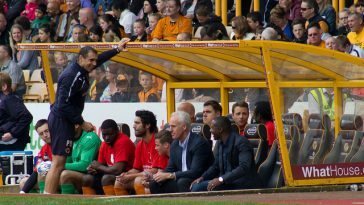 The absence of Sean Maguire was also questioned with a five man midfield behind David McGoldrick clearly the plan. From my perspective, I’ve always thought Whelan was a bit of an undeserved scapegoat and appreciated the longevity of his Premier League career and the fact that he’s been in great form in the Championship with Aston Villa recently. 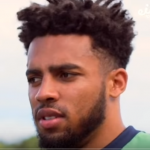 I’d have been tempted to try Doherty in right midfield again with doubts about Robbie Brady’s match fitness but other than that, the team really picked itself. My only hope was we’d see more from them than we had on Saturday. After heading to the ground, I was pleasantly surprised to encounter a standard security check rather than what we’d become used to in the Singing Section since the USA game immediately after the Scotland ticketing debacle in 2014. We got through far quicker than normal and made our spot in plenty of time for the anthems and ubiquitous one-minute silence/applause that seems to come before every game these days. 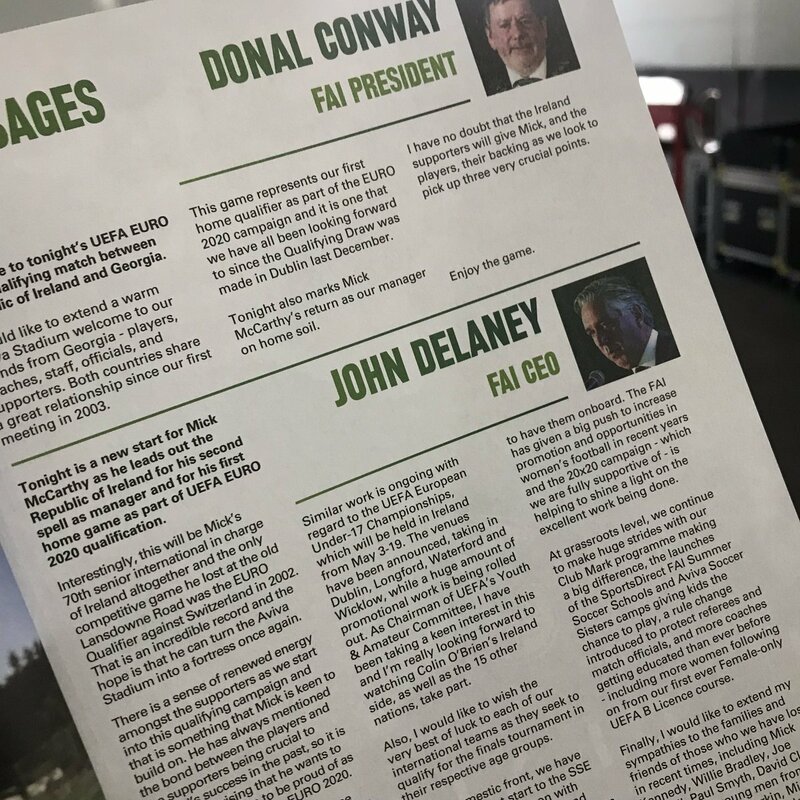 The fact that the FAI had failed to inform their printers about their long-planned change of CEO raised a few laughs when people noted JD still beaming out from the Chief Executive panel in the programme but that was soon forgotten as the game started and Ireland tore into the opposition immediately. It was clear from the off that this Ireland were a very different proposition from the team witnessed in Gibraltar three days before. Within the first ten minutes, we witnessed Jeff Hendrick pushing on with overlapping support from both Enda Stevens and Seamus Coleman, Conor Hourihane linking well with David McGoldrick, Robbie Brady getting a shot off from a good position and Hendrick and Coleman linking well again before a poor cross from the captain. The tempo was excellent, the pressing was excellent and all that was missing was the final execution with the last delivery or shot letting the good build-up down. Georgia immediately looked like they were struggling to deal with that tempo and clearly hadn’t expected it. The crowd had been lively from the kick off with a vocal outing of chants protesting mixed in with those for the team. There were also a number of banners printed on large sheets of paper which had obviously been decided as the easiest way to get them into the ground. 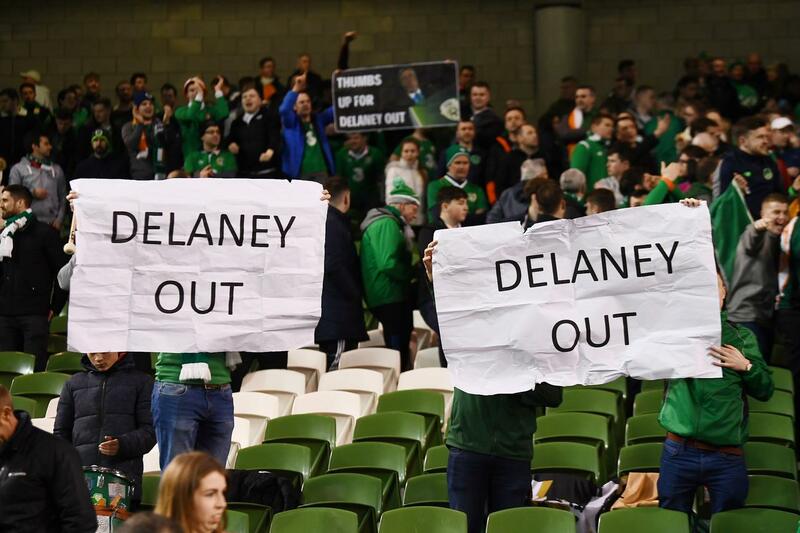 Unlike previous occasions when such banners became visible, there were no efforts from the stewards or gardai to move in and confiscate them. On the ten minute mark, Ireland should have been ahead. Hendrick slid in to win possession and played McGoldrick in. The Sheffield Utd striker passed it on to Hourihane who really should have picked out Robbie Brady instead of hitting a weak shot easily saved. It was a chance missed but again, really encouraging build up. McGoldrick dug out another chance a couple of minutes later before a Brady free kick in a great position was hit straight into the wall. Another attack came immediately resulting in another free, this time on the left. Whelan played this one short to Robbie Brady in what was a reverse image of Liam Lawrence’s pass for Whelan’s famous goal against Italy at Croke Park. In fact, this was about as far forward as I’ve seen Whelan allowed since then! Unfortunately, Brady couldn’t replicate Whelan’s finish of a decade before and the ball sailed over. By now, we’d seen more chances created in twenty minutes than the entire Nations League campaign. Georgia had had a couple of break-outs but they’d been comfortably dealt with by Duffy and Keogh. Anything that was reaching Randolph, he had under control and we were still asserting ourselves and had a shout for a penalty when he tumbled under pressure from Davit Khocholava but the ref got it right by waving it away. What happened immediately after that was indicative of the change in mindset. Georgia attempted to clear but the ball was intercepted by centre-half Richard Keogh, stepping up beyond the opposition’s side of the centre circle to take command and start another attack. This attack was again let down by a poor Coleman pass but another corner was the reward for the positivity. As the lone man up front, McGoldrick was covering every blade of grass and actually dropping far deeper than should be expected. But when he did that, he was winning every ball and the midfield were pushing on to give him options ahead. A couple of times, he got the ball out of our ridiculously tight situations and used it well before getting back into forward positions to look for the return. I said as soon as McCarthy was appointed that McGoldrick would be a big player for him after their time at Ipswich together and he was proving it in spades here. McGoldrick was involved again in what, for more reasons than one, became the decisive part of the game. It was he who was pulled down about 25 yards out as the game reached the 33rd minute. With the free in a very good position, Whelan and Hourihane stood over it as the wall lined up and the ref marked out ten yards. Now, as I said earlier, I don’t know who initially mooted the idea of throwing tennis balls onto the pitch and I didn’t see where the first one came from but once one came down, another forty or so followed. The majority were from the South end although more from the sides than the centre, there were a few from the North end and a small amount from East and West. To be honest, it initially got a mixed reception even from those protesting in our area. 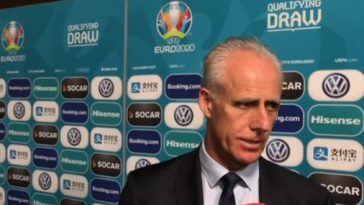 I assume the 33rd minute was a reference to Delaney’s infamous suggestion that Ireland be allowed compete as the 33rd team in the World Cup after Thierry Henry’s even more infamous handball. But there was definitely a sense that disrupting the game just when we had a really good chance after a great start could be counter-productive. After the tennis balls we get the smash hit. Attaboy @conorhourihane #irlgeo #irevgeo #rtesoccer https://www.rte.ie/sport/soccer/2019/0326/1038786-republic-of-ireland-georgia-live-blog-updates-euro-2020/ …5129:23 PM – Mar 26, 2019117 people are talking about thisTwitter Ads info and privacyAs it turned out, the two-minute delay made no difference and for those protesting, what transpired afterwards really couldn’t have worked out any better. Once the pitch was clear, Whelan and Hourihane took their positions again and with Whelan stepping back and Shane Duffy leaning into the wall, Hourihane stepped up to serve up an ace of a free-kick around the wall leaving Loria in the Georgian goal no chance whatsoever! One nil and Ireland had the lead they deserved. Any potential negative reaction from the support was banished at that moment which may not have been the case had the two-minute break disrupted the tempo we had been playing at. The fact that this happened at 33 minutes indicates to me that there was some planning involved but given the different areas of the ground they came from I wonder whether some had just got the idea from the level of whipping up that the media had been partaking in. Either way, as protests go, it’s pretty harmless in comparison to what you might see in some other countries and a slap on the wrist and a fine should see the end of it from UEFA while the publicity gained can only be a positive. There was a little lull following the goal but the tempo lifted again coming into the last five minutes with a corner just missing Keogh. Another indication that this could be a good night for those protesting came in the four minutes stoppage time at the end of the half. Despite the fact that the time added on was legitimate and there would have been the same game time played had no protest occurred. 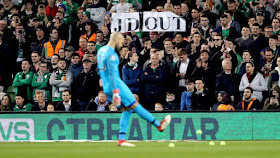 Had Randolph not pulled off an unreal save from Valeriane Gvilia’s volley, there’s no doubt that a goal at that stage would have been blamed on the protest. As it happened, one nil at half time was the least we deserved. The 57% first-half possession was a long distance from the 26% we ‘enjoyed’ the last time the sides met in September 2017. The fact that so much of that took place in the opposition half made for the most enjoyable 45 minutes Lansdowne had witnessed in a long time. The second half began at a similar tempo. McClean was harrying their right-back although once again, the end product was lacking. We really should have gone two up just before the hour mark after a nineteen pass move ended with Henrick knocking the ball in from a slightly offside position. Notwithstanding the fact that Hendrick could easily have checked his run and stayed onside without losing the chance or left the ball for Coleman behind him who could have rolled it into an empty net, to see Ireland pass the ball around like that and create a great chance was a joy. Another call for a penalty followed as McGoldrick went down under a challenge from Solomon Kverkveliya after good work from McClean on the left. At the time I thought there was no way he would have gone down in such a good position had he not been fouled but watching the replay since the ref probably got it right. The long ball from James McClean sees David McGoldrick clean through but the ball just runs wide #irlgeo #irevgeo #rtesoccer https://www.rte.ie/sport/soccer/2019/0326/1038786-republic-of-ireland-georgia-live-blog-updates-euro-2020/ …610:19 PM – Mar 26, 2019See RTÉ Soccer’s other TweetsTwitter Ads info and privacyAlmost game, set and match Georgia worked another couple of chances but the Irish defence was holding firm and still pushing on whenever possible. 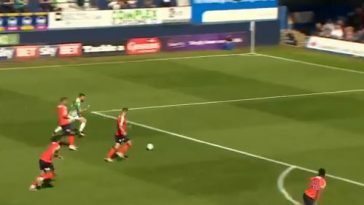 Enda Stevens probably should have scored only to scuff a shot with twenty minutes to go. Moments later, McGoldrick was sent through one-on-one from a McClean ball over the top but dragged it just too wide when rounding the keeper and just couldn’t hook the ball in from a very tight angle. Had he kept his run closer to the keeper he could well have gone over him but he may have had the previous penalty call on his mind and the chance passed. Aiden O’Brien then came in for Brady who had put in a good shift but still looked a bit off the pace for me. The fact that the tempo had been so high could account for that to be fair. McGoldrick had one last chance to grab the goal his performance deserved only for Kverkveliya to get a good block in before the clear man of the match was withdrawn to a huge ovation from the crowd. It’s a long time since I’ve seen a striker put in that level of effort and cover that much ground in a game and the sustained applause was richly deserved. Matt Doherty was the man brought in to shore things up for the final ten and O’Brien moved inside to free up the right wing. There was still enough time for one heart in the mouth moment when a great effort from Jaba Kankava clipped the outside of the post. Had it gone in, it really would have made an issue over the missed chances and wrong final ball options and despite our jokes that Randolph had it covered, had it been a foot the other side of the post he’d not have got near it. Georgia took a lift from that and began to put pressure on as a visibly tiring Ireland retreated for once but once the four minutes stoppage time was announced we saw another effort from the men in green and even a sliced Whelan shot that went out for a throw-in right beside the corner flag got rapturous applause. Whelan has received a lot of criticism in the past, unfairly in my opinion, for doing what he was instructed to do by successive managers. He’s that sort of player and when he has been allowed more freedom for his clubs, he’s generally shown that he can play. He wasn’t far off McGoldrick for man of the match in my opinion and showed a side of his game that has rarely been seen in green. 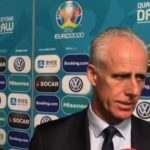 Mick McCarthy was roaring his men forward to prevent Georgia from creating anything and with them pushing again, another Hendrick interception sent McClean clear. Instead of running for the corner, he inexplicably booted the ball straight into Loria’s arms in another example of poor final decision making much to the rage of all present. As Georgia had a final push, we got numbers back and blocks from Keogh and Doherty saw the final danger off and when Hourihane finally got released, he headed for the left wing and under pressure rolled the ball down the touchline to eat up the final few seconds to confirm the win and the three points. The win wasn’t the biggest thing to take from this. Had it been a scrappy 1-0, after similar in Gibraltar, then despite being in the same position points wise, legitimate questions would still be being asked and there’d be little sense of change. As it is, the astonishing comeback from Denmark from 3-0 down on 85 minutes to grab a draw leaves us top of the group and with a new sense of optimism and purpose. The fact that the two most influential players on the park in McGoldrick and Whelan wouldn’t have been involved without that change in management adds another dimension to the win. But let’s not get overly carried away. This was a team who we seem to have the hex on and there’s certainly harder battles ahead. Both Switzerland and Denmark will be far harder tests and we’ll have a better idea of how we’ve developed after the Denmark game in June. Still, you can only beat what’s in front of you and it’s mission accomplished for this international break. However, mission is far from accomplished for those of us that believe change is also necessary at board level. While the protests on Tuesday certainly kept things in the news cycle for a few extra days, this feels like only the beginning. 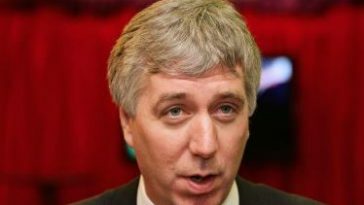 With an Oireachtas Committee hearing due to occur on April 10th, this momentum needs to be continued. If you have concerns over recent and not so recent revelations then raise issues with those politicians involved or with the media. If there’s one thing politicians like it’s a bandwagon and if they feel the wind is blowing a certain direction, you can be sure they’ll tilt their sails that way. Having seen the landscape move in terms of what we witnessed on the pitch, let’s see how it looks when we return in June.